The Dungeon Master’s Guide from Dungeons & Dragons is available in stores today. This is the book I’ve been waiting for. I’ve rather enjoyed Dungeons & Dragons’ 5th edition, and the books have so far been stellar. But this book. This book is the one. 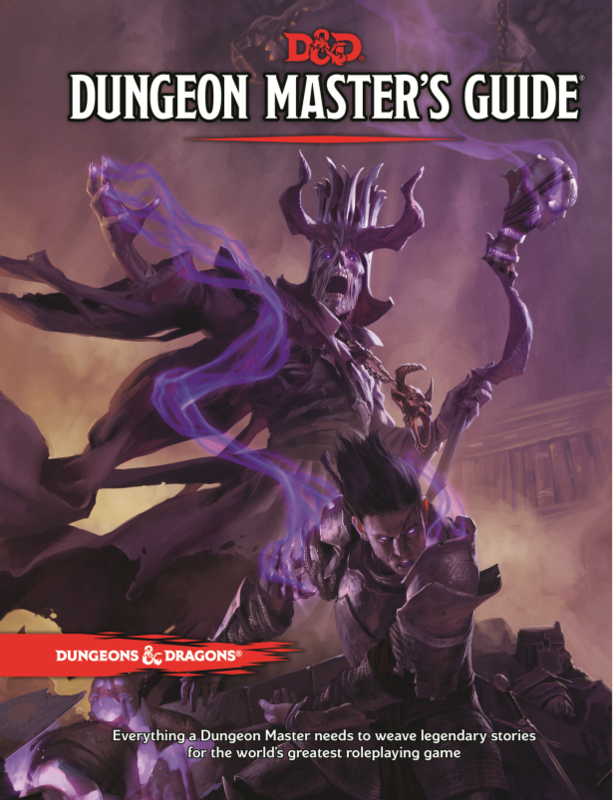 The 5th edition Dungeon Master’s Guide, out today from Wizards of the Coast, is exactly what a dedicated DM needs. Of course, anybody familiar with the game can pick up a pre-written adventure and lead a group of characters through the fights and role play. But what should you do after that? What kind of world do your characters inhabit? What about the dungeon that’s named in your adventure but not described? Who is your villain? Who are the NPCs your adventurers meet along the way? What I love about this book is that’s exactly what it does for you. If you’re a new DM, it lays down all the basics for creating a campaign, creating a world and populating that world with people, dungeons, monsters and magic items. If you’re an experienced DM who knows his stuff, this book will double as a handy reference (so many rules explained!) as well as a source for new material (10 pages on character options and ideas for NPCs and 100 pages on treasure/magic items should give you plenty of options). I think my favorite part of the book is all the random tables. Take, for example, the complete dungeon I created in about 10 minutes. All it took was some dice and a pencil. Give me a few minutes more and I could draw out a full size map that we could use with miniatures. There is, of course, a complete rules section from a DM’s perspective. It lays out things such as common checks, travel pace, chases and madness. Most fun to me are the sections on how to build encounters and creating your own monsters and races. D&D is doing well for itself in this new edition. For a guy like me who started with 3, picked up again with 4 and then went back to Pathfinder/3.5, this strikes a perfect balance between the combat-heavy rules of 4th and the intricate and more open experience of 3.5. And it does it all while maintaining a pretty open view toward playing your game. The 5th edition of D&D is built so your campaign can be whatever you want it to be. So, magic doesn’t always work in your world? There are rules for that. You want to outfit your players with guns? There are rules for that. Want to play on a hex grid instead of squares? There are rules for that. You need to create a special magic item for your villain to wield? There are rules for that, too. And so far, the books have been fantastic. The Player’s Handbook offered lots of options for players. (It’s the first time I was ever interested in a bard.) The Monster Manual has all those glorious dungeon denizens for a DM to throw at his party. (And all that art, too.) And even the two hardcover adventures, “Hoard of the Dragon Queen” and “Rise of Tiamat,” have been really fun. The Dungeon Master’s Guide is what ties it all together.